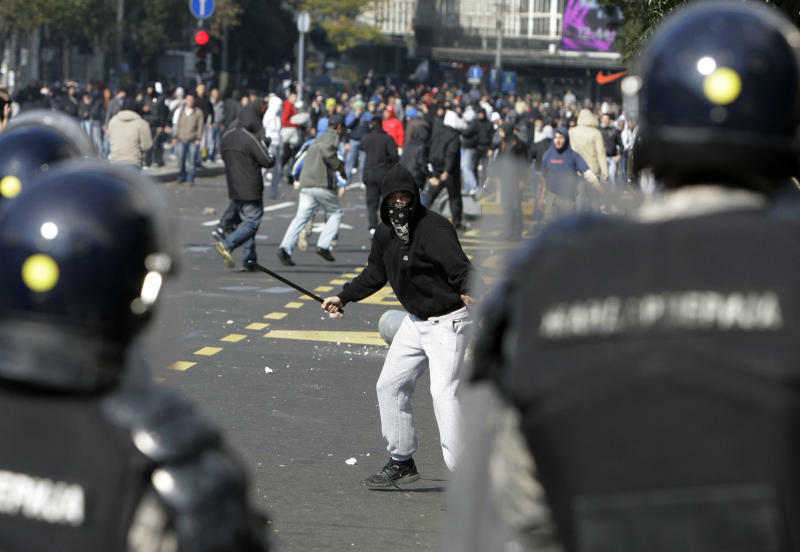 BELGRADE, Serbia (AP) — Gays and soldiers usually don't mix in the conservative Balkans. Neither do former foes from the region's ethnic wars. Yet a tale about a Serbian wartime fighter who recruits enemy veterans to protect a gay pride event has become an unlikely movie sensation. "The Parade," a black comedy made by a Serbian director, has been the biggest box office hit in the former Yugoslavia in years, even as it challenges both the region's ethnic divide and its deeply rooted homophobia. The movie has drawn more than half a million people since its release in October. It has been equally acclaimed in Serbia, Croatia and Bosnia — something no local film has managed since the 1990s wars between the ex-Yugoslav republics. "The whole region is united for the first time in liking this film," director Srdjan Dragojevic said in an interview. "The Parade" — which won an award at the prestigious Berlin film festival this year — is set in the Serbian capital of Belgrade, where a gay couple tries to organize a gay pride event in the face of threats and violence from far-right groups. To make it possible, they enlist a Serbian war veteran to protect the parade; he brings in a group of ragtag former fighters from other Yugoslav republics — a Croatian, a Bosnian Muslim and a Kosovo Albanian. Using an uproarious plot spiced with dry humor, Dragojevic tackles Balkan prejudices and the highly sensitive topics of gay rights and postwar relations. Film critic Milan Vlajcic says Dragojevic's success lies in the fact that he managed to send a universal message of tolerance, without turning the film into a propaganda tool. "Black humor played a key role," Vlajcic said. While Serbia's gay activists have been divided about the role the movie plays in promoting gay rights, Dragojevic insists that "it is very important for people to recognize the simple message that it is irrelevant what nationality you are, how you pray or who you go to bed with." Wounds stemming from the Balkans war remain a source of division years after the fighting ended. The frictions were apparent during a recent premiere of Hollywood star Angelina Jolie's directorial debut — a love story set in the Bosnian war — which received standing ovations in Bosnia, but was shunned by Serbs as propaganda. "The Parade" — co-produced by companies in Serbia, Croatia, Macedonia, Slovenia and Great Britain — seems to have been accepted by most, if not all. In Bosnia, it has become the most popular Serbian film since the war, seen more times than James Cameron's "Avatar," said the film's Bosnian distributor. In Croatia, some 150,000 people have seen "The Parade." Still, Croatia's influential Catholic Church banned the screening of Dragojevic's film in a church-owned theater in the coastal town of Dubrovnik. 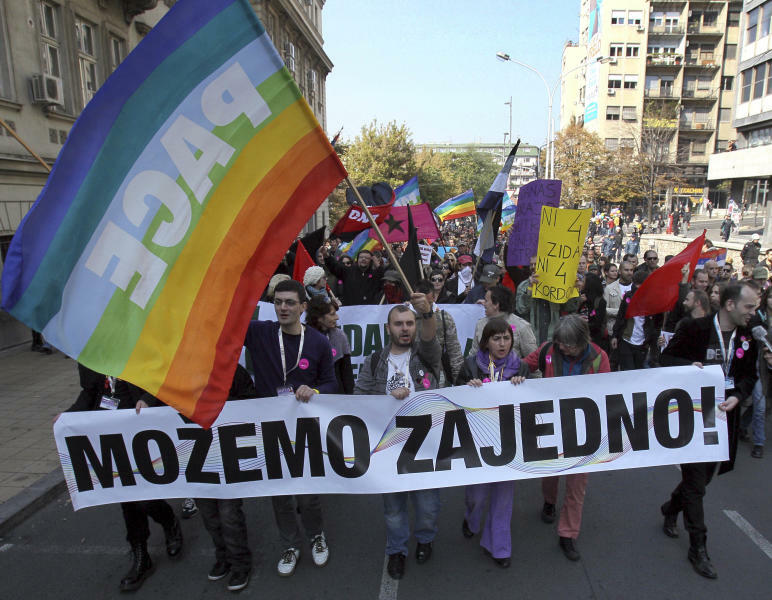 The church objected to the gay theme and Dragojevic's alleged attempt to put equal blame for the war on all sides. Illustrating attempts by authorities to underline divisions between Serbs and Croats, Croatian authorities recently asked local TV stations and film distributors to put subtitles on all Serbian movies, although the two nations speak an almost identical language. Dragojevic's earlier film Rane (Wounds) was among the first to be subtitled in Croatia in the early 2000. The opening scene caused the audience to break into laughter: When the words "Jesen 1991" (Fall of 1991) appeared on the screen, the Croatian subtitle below it was identical: Jesen 1991. Dragojevic said the success of his movie shows that common bonds of culture and history exist in the Balkans. "That is bad news for nationalists," he said. Dusan Stojanovic in Serbia, Aida Cerkez in Bosnia and Darko Bandic in Croatia contributed to this report.